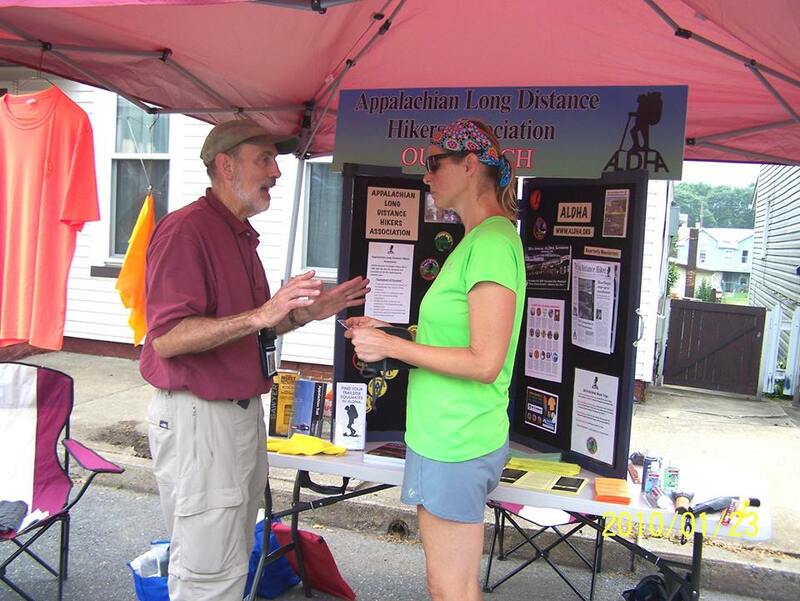 If there's a trail festival that celebrates the Appalachian Trail, ALDHA tries to be there with a display and at least one volunteer member to plug and promote the benefits of the Appalachian Long Distance Hikers Association, the only membership group on the trail devoted solely to the hiker. The ALDHA display can be seen at biennial conferences of the Appalachian Trail Conservancy, the Southern and Northern Rucks, smaller trail festivals in towns like Hot Springs, N.C., Millinocket, Maine, and the A.T. Kickoff in Georgia, and at the Appalachian Trail Museum's festival in Pennsylvania for National Trails Day. Our biggest event for outreach, of course, is at Trail Days in Damascus, Va., where we set up a huge pavilion-like tent to show off our organization to the public. We also host a hiker feed in the Rock School to meet and greet (and feed) the hikers. The ALDHA display has evolved over the years and now commands several tables to show off things like the Companion, the newsletter, the Endangered Services Campaign and our new search and rescue team. Copies of our brochure, updated annually, are liberally handed out. 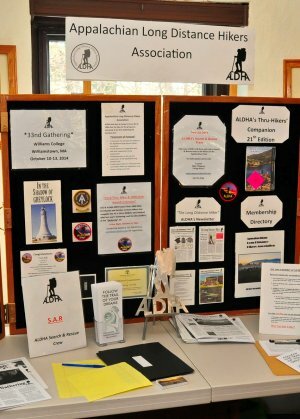 At the 2014 Gathering in Williamstown, there was a new exhibit created that is devoted solely to The Long Distance Hiker, ALDHA's newsletter since 1983. And all this is in addition to the space we take up to display memorabilia from the ALDHA Store, including T-shirts, patches and bandanas, making anyone who wears one a walking ambassador for ALDHA. Now shepherding ALDHA's outreach efforts will be a new outreach coordinator, who will continue to expand our reach so we have a presence at some major outdoor exhibitions, including one held in Minneapolis, where ALDHA has set up its exhibit at the Outdoor Adventure Expo for a few years now. If you have any questions about our outreach efforts, contact the coordinator at coordinator@aldha.org. The ALDHA Care program will provide assistance to low-cost and donation-only hostels along the Appalachian Trail. Assistance to these service providers will be made available via financial support, organized maintenance/cleaning events and by helping low-cost and donation-only hostels with day-to-day operations during the peak hiker season. Assistance will include an annual care package of supplies and an annual spring cleaning/maintenance event at the hostel deemed in most need. The care packages will consist of things like toilet paper, paper towels, cleaning products, soap, shampoo and laundry detergent. There are some low-cost and donation-only hostels that are run on a shoestring budget, and many are highly used during the peak hiker season. 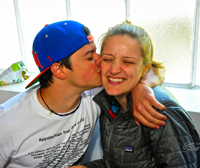 These hostels rarely turn a profit, and they are in need of assistance on an annual basis. Further, a few of these hostels are in danger of closing due to the poor behavior of some hikers; therefore, ALDHA via the ALDHA Care program will show their appreciation and support of these hostels with a spring cleaning and maintenance event. This event will include a thorough cleaning of the hostel, grounds maintenance, and light facility maintenance in order for the hostel to be ready and set up for success during the peak hiker season. This event will be coordinated annually for the hostel that displays the greatest need at that time. If you have any questions about the program, contact ALDHA Care program coordinator Jim Chambers at aldhacare@aldha.org. Continuing a tradition begun by former Coordinator Mike Wingeart, ALDHA board member Steve Toth is compiling binder notebooks for each A.T. hostel to share information about programs, activities and other features of our group with this year's new crop of long-distance hikers. Details on the annual Gathering, the Companion, the newsletter, website, work trips, search and rescue, the Endangered Services Campaign and other ALDHA activities are included, along with copies of the Gathering program from the previous year and a copy or two of a recent newsletter. 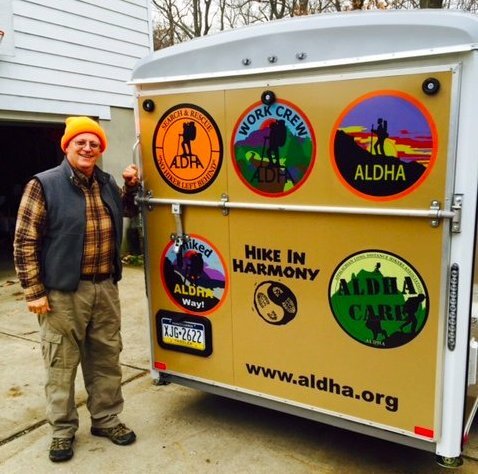 The point is that it's a traveling billboard for all things ALDHA, and people do notice it while it's being hauled to a trail event, often for hundreds of miles. Dubbed Sherpa, it is becoming a well-known symbol of ALDHA wherever ALDHA has a presence. 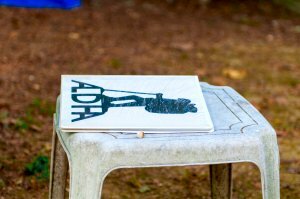 If there's a major trail event happening somewhere, chances are ALDHA will be there with an exhibit and a couple of folks talking up the organization and the benefits of attending our annual Gathering in the fall. It's a mission that was formalized in 2011 with the appointment of Judy Young as ALDHA's first outreach coordinator. It's her job to make sure folks hear about ALDHA at events like Trail Days and the A.T. Kickoff. The ALDHA exhibit and/or the ALDHA Store have hit just about every festival from Georgia to Maine since about 1996, when a new traveling display was created to spread the word. 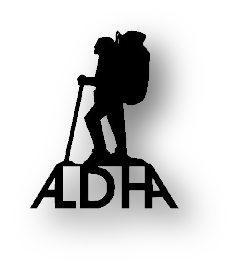 Our first formal presentation at Trail Days was called "All About ALDHA" and introduced thru-hikers to the group that's devoted to their best interests. A photo from one of the first such programs shows an active northbounder pouring over the exhibit and other materials. After his thru-hike he came to the Gathering and has remained active ever since, even serving a stint on the ALDHA board of directors. The hiker in that photo was "Slider," aka Kevin Reardon. 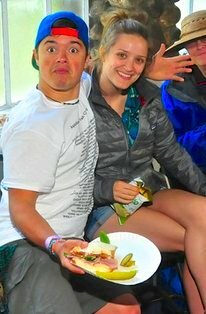 ALDHA's presence at Trail Days has since been expanded to a very important role: Feeding hungry hikers. 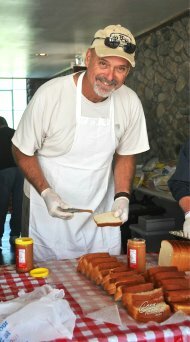 The Rock School becomes a lunch room of sorts as a host of volunteers, like Mark Suiters ("Stumpknocker") above, lays out a spread of sandwiches, deserts and drinks, all for hikers. If there's a trail event you'd like to have ALDHA attend, let us know. Contact the ALDHA Outreach Coordinator by email at outreach@aldha.org. Just a portion of the ALDHA exhibit that was set up at the Northern Ruck at Bears Den Hostel in Virginia in 2014. One of ALDHA's hostel notebooks is seen above at the RPH Shelter in New York state during an RPH-ALDHA work trip.